What started as a TV show is now ready for mobile phones! 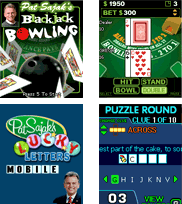 Draw cards and bowl to reach "21" as America's most-loved game show host takes you from the blackjack table to the bowling lane. It's the classic casino game, with a twist! Fun for all ages  if you can play 21, you can play Blackjack Bowling. Hit, Stand, or Bowl your way to beating the dealer. Blackjack pays 3 to 2  and Blackjack Bowling pays 2 to 1. Player must bowl in 5th and 10th frames and in the 11th Frame. Easy to play: Simple button options, toggle to wager, and 3 clicks to bowl. Cards and buttons are easy to read and the alley includes custom graphics. High Roller: Score in the Top 100 and play on blue felt with a blue bowling ball. King Pin: Score in the Top 20 and bowl your next game on special gold felt with a gold bowling ball.